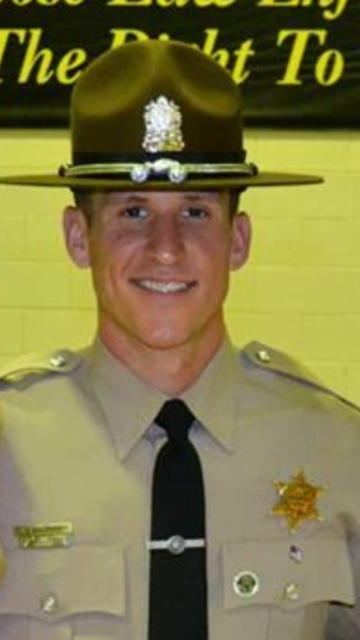 SIUE Criminal Justice Studies alum; Matthew Bradford of the Illinois State Police District 11 has been awarded the Medal of Valor. Matthew Bradford is a 2013 graduate of the SIUE Criminal Justice program, who joined the Illinois State Police upon graduation. This past October, Trooper Matthew Bradford had stopped a vehicle in East St. Louis for a seat belt violation. As Bradford approached, the passenger fled the vehicle. Trooper Bradford attempted to take the suspect into custody several times, in which the suspect fought and escaped. The struggles escalated from scuffles to the suspect attempting to handcuff Bradford with his own handcuffs, and eventually the suspect shot at Bradford 4 times. It was later discovered that the suspect had $75,000 in warrants out of St. Louis County, had an extensive criminal history, and was a member of the Vice Lord Nation. Trooper Bradford’s bravery and tenacity brought this dangerous criminal to justice, and it is hard telling what may have happened if this subject was still on the streets. The Medal of Valor Award may be awarded to law enforcement personnel or citizens who distinguish themselves by conspicuous bravery or heroism above and beyond the normal demands of police service, or that, which is expected of a citizen. In October of 2017, Trooper Bradford conducted a traffic stop on a vehicle in East St. Louis. The passenger of the vehicle fled, and Trooper Bradford gave chase. Trooper Bradford caught up to the suspect and attempted to take him into custody. The suspect resisted and continued to run. As the suspect again fled, he shot at Trooper Bradford four times. Trooper Bradford prepared to return fire but noticed the suspect was running into a highly populated area and towards a busy street. Trooper Bradford continued to give chase, and the suspect ran into a small wooded area and hid. The suspect eventually ran out of the wooded area, and Trooper Bradford again engaged him. After another significant struggle, Trooper Bradford was able to secure the suspect. “The Criminal Justice Program at SIUE is very proud of our alumni, Matt Bradford. Matt was an excellent student during his career at SIUE. The CJ faculty is not surprised that he has gone on to prove himself as an excellent officer for the Illinois State Police.” Said Dr. Kevin Cannon, Chair of The Criminal Justice Program. Illinois State Police District 11 Commander Timothy Tyler and Sgt. D. Ramert of the Illinois State Police nominated Bradford for the award. The Awards Banquet was held on January 18, 2018, in Fairview Heights, Illinois. The SIUE Criminal Justice Studies offers a major, a minor, and partnerships with several other interdisciplinary minors in the College of Arts & Sciences, such as Forensics, Pre-Law, and Women’s Studies. In the Fall of 208, Criminal Justice will be implementing an online Master’s Degree program, focusing in Criminal Justice Policy.